as presented by published author, Jeffrey R. Horton, cofounder of Chronos Ministries. Published by Christian Faith Publishing, Horton’s new book is the first in a series of three books, each of which focuses on crucial keys to unlocking the prophetic puzzle of end-time passages. The author uses the Bible to explain biblical passages, fitting the pieces of the prophetic puzzle together in a unified whole. It’s a message of comfort, hope, and victory. View a synopsis of “See the Day Approaching: How You Can Know that Jesus Christ is Coming Soon” on YouTube and at ChronosMinistries.org. Consumers can purchase the book at bookstores or online at Amazon.com, Apple iTunes store, Kobo, Barnes & Noble, and Books-A-Million. 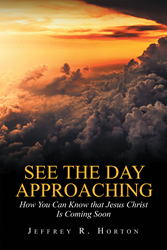 For additional information or inquiries about “See the Day Approaching: How You Can Know that Jesus Christ is Coming Soon,” contact the Christian Faith Publishing media department at 866-554-0919.